KST2Me is an application written by Bo OZ1M, and makes using the ON4KST chat pages much simpler. It uses the Telnet connection to the ON4KST server so it’s also much quicker on slower connections. 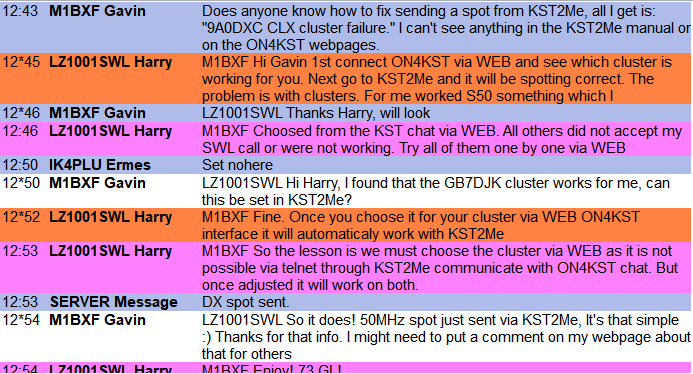 I looked in the KST2Me manual, and ON4KST pages (using Google) for an answer, however I couldn’t find one so I asked on the VHF chat page, and Harry LZ1001SWL responded with the solution, thanks Harry! 1. Log into the Web version of ON4KST (any one will do). 2. In the ‘Menu’ dropdown, select ‘Web/Clx DX-spot’. 3. 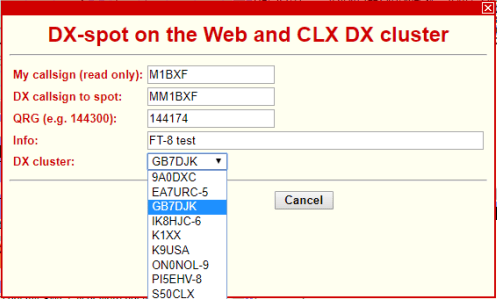 From the dropdown, select a DX Cluster, send a DX-spot and see if the spot is successful. If you get an ‘CLX cluster failure’ message, try the next DX cluster in the dropdown. 4. Once you find a DX Cluster which works then you are done. ON4KST will save the last used DX Cluster as your default for future DX-spots, this also applies to KST2Me. So once you have made a successful DX-spot on the Web version of ON4KST, pressing F12 and entering DX-spot data in KST2Me will result in your DX-spot now being accepted and posted to the DX cluster network. A big thanks to Harry LZ1001SWL for pointing me in the right direction on how to fix this annoying problem I’ve had for years.